The act of stand up paddle boarding (or supping) stretches centuries back to Africa, but it has in the last few years become more well known as a modern sport or leisure activity, being formally recognized in 2013 as the sport or leisure activity most popular with first time participants! 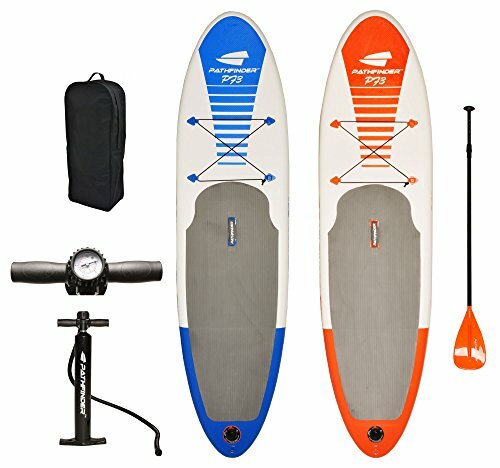 [WIDE SUP DESIGN] - The Tower Inflatable Stand Up Paddle Board is 10'4" long and provides 32" of deck width for improved stability and balance while standing. [SUPERIOR MANEUVERABILITY] - The large single bottom fin helps improve overall speed, handling and steering for easier use by kids, teens and adults alike. [MILITARY GRADE MATERIAL] - 6" Thick Military-Grade PVC material and Drop-Stitch construction provides extreme durability. Never worry again about dings and board cracks. What makes the Tower Inflatable Adventurer so special? Being 6 inches thick, this board is much better performing and rigid than thinner inflatable boards. Due to thickness, this board will also float and stand much higher off of the water than thinner inflatable boards. 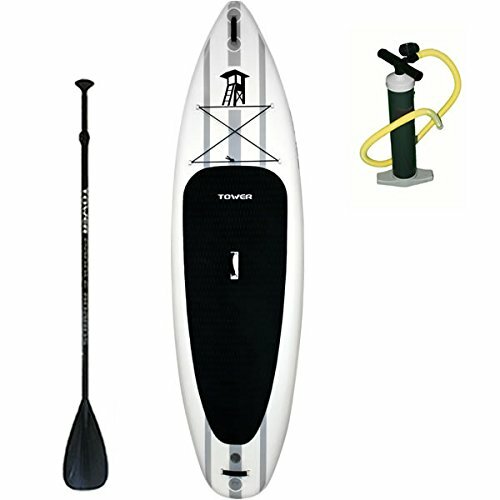 The Tower Paddle Boards Inflatable Adventurer 2″ 10’4″ Stand Up Paddle Board is sold along with an adjustable 3 piece oar constructed from fiberglass, and hand pump for easy inflation. The weight limit of this inflatable stand up paddle board is 350 pounds (or just under 159 kilograms), which makes this a good board for those who hope to paddle with their dogs once they’ve gained more experience! The bungee rope that comes with this board also makes it good for longer trips as you can easily store gear. Overall, the Tower Paddle Boards Inflatable Adventurer 2″ 10’4″ Stand Up Paddle Board is priced pretty mid ranged, it’s seriously robust and it comes with the usual two year warranty that the Tower Paddle Boards company offers. The warranty is great for inexperienced paddlers, and more than compensates for the price! What makes the PathFinder Inflatable SUP so special? This inflatable board is a bit shorter than most of the beginner boards, but it is thick enough with a wide enough deck to provide impressive stability, and the shortness of it makes it great for being on waves. The PathFinder Inflatable SUP Stand Up Paddle Board 9′ 9″ is constructed with a multi-layer drop stitch and PVC, so durability is guaranteed. A carry bag with shoulder straps, a detachable center fin, a valve wrench, a pump and an aluminum oar which is totally adjustable, are all sold together with this board, which is one of the cheaper, good quality stand up paddle boards available! The price of this inflatable stand up paddle board is a real pull for anyone just starting out. Overall, the PathFinder Inflatable SUP Stand Up Paddle Board 9′ 9″ is inexpensive and reliable! What makes the Ten Toes Inflatable SUP so special? This mid range priced stand up paddle board is constructed from military grade PVC, which makes this board basically completely impervious to damage like tears or punctures, a real concern for beginners who might drag or snag their boards! The Ten Toes 10′ Weekender Inflatable Stand Up Paddle Board is inflatable, but it’s just as rigid and sturdy as a non inflatable board when it’s fully inflated. The weight limit of this board is 250 pounds (or just over 113 kilograms), so it’s safely suitable for anyone. 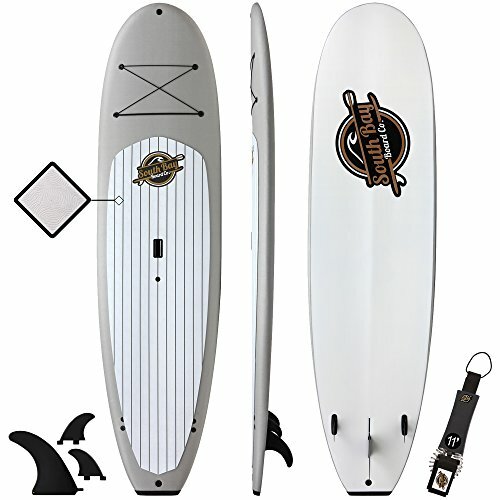 When you buy this board, you’ll also be getting a repair kit, 3 removable fins, a super lightweight and adjustable aluminum oar and a manual pump. The deck of this stand up paddle board is covered with an EVA textured foam pad, which is soft, comfortable and provides you with that extra grip you will need while you’re still learning how to balance well. The reinforced carry handle that’s moulded into this board makes carrying it into and out the water a breeze. 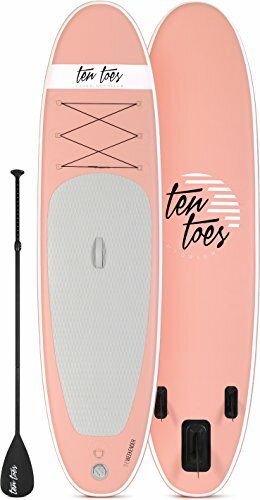 Overall, the Ten Toes 10′ Weekender Inflatable Stand Up Paddle Board is a total steal for the price, and it comes with a two year warranty (that you probably won’t even need). Not to mention that it’s just a really cool looking board! What makes the Gold Coast Surfboards SUP so special? This board really wide and long, coming at 32 inches of deck space and 124 inches of length. These dimensions makes for a sturdy and stable paddle board, perfect for those wobbly beginner legs! The Gold Coast Surfboards – 10’4 Anima SUP – Soft Top Stand Up Paddle Board comes with 3 detachable fins that make for smooth and easy gliding, bungee tie downs for storage of gear, and has built in carry handles for easy transportation. The core of this stand up paddle board is made of closed cell EPS foam, which means that in the incredibly unlikely event of damage to the board, it won’t absorb any water at all! The soft top of this board also ensures that you’ll have good grip. Overall, the Gold Coast Surfboards – 10’4 Anima SUP – Soft Top Stand Up Paddle Board is probably one of the best first timer stand up paddle boards out there! The stability, thickness and comfort of this mid range priced board is really impressive. What Makes a Good Beginner Stand Up Paddle Board? The reason that affordability is a factor in choosing a stand up paddle board as a beginner is that there may a small (very, very small!) chance that you decide that this sport is not for you. Ideally you would rent a stand up paddle board first and test it out before buying one for yourself. Quality and safety should however never be sacrificed for affordabilities sake! Always stay safe while having fun! Stand up paddle boarding is actually way easier than it looks (just bend those knees and move with the water! ), although for some, balancing might not be your strong suit. Having a stable board will make it easier for you to stay on your board, especially if you’re tackling the ocean. Boards that are around 10 to 12 feet long are going to be more stable than others. Being a beginner stand up paddle boarder, chances are you’re going to wipe out a few times, knock your board around or maybe not be clued up on how to properly store and transport your board. This is all totally normal! But your board needs to be strong and reliable, which all of the boards we’ll discuss below are. So keep in mind to take a close look at the materials that your board is made up of. The stronger and tougher, the better for a beginner. Buying a beginner board doesn’t mean that you’re just going to buy it, use it for the first few months and then get rid of it! These beginner boards are so awesome because they are suitable for people of all skill levels including beginners. After you’ve gotten started stand up paddle boarding, you might find that you enjoy the waves of the ocean, or perhaps the stillness of lakes, the only way to find out where you like to paddle in most is by actually getting out there! So because of this, a versatile board is super important for beginners.